This is one of the questions that in hindsight I wish I had asked in a more detailed way. Specifically, how do the PCs know something is magical at all? Never mind what it does or how it is used. Mass-market fantasy now often portrays magic items as glowing or otherwise visually marked. Games like Diablo color items based on their rarity and power. This is not totally without precedent in the foundational literature (Bilbo’s Sting did glow blue in the presence of orcs, though this is less like an identifying mark and more like a power). Did Excalibur glow? I don’t think so. What about the hide of the Nemean Lion? Characters knew that these items were powerful because they were singular and legendary within the story as well as outside of it. Is every richly embroidered robe and jeweled sword possibly a magic item? Because of practical game considerations, probably not. The most common solution to this problem is to allow PCs to just sense magic in some way or another. That is fine and workmanlike, but robs magic items of a sense of mystery and a need for background. This is one of the many reasons that D&D magic can often feel mundane and commonplace. Assume for the moment that the first hurdle has been cleared. The item is known to be enchanted. How do the PCs discover what it does and how to use it? The most common answer I have seen to this question is to experiment. What does experimentation mean? For a potion, the convention is to take a small taste (enough, perhaps, to trigger a poison potion). But what about other kinds of items? Is it enough to pick up a wand and wiggle it? Is it enough to say “I experiment” in much the same way that, in some games, it is enough to say “I search for traps” without further detail? And, if so, how is the result determined? 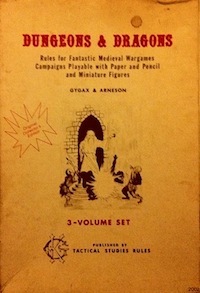 Must there be a diegetic aspect to the activation such as a control word that the players must discover by interacting with the campaign world? A diegetic method would be very engaging if you have such details prepared (or a method for generating them on the fly). In my current game, I use a simplified version of the arcana skill (4E PHB page 181) for detection of non-obvious enchantment. Generally, I just make this a DC 15 arcana check available to characters that are trained in the skill. Sometimes I adjust the DC if there is some reason that someone might have been trying to conceal the magic (such as a trap), and sometimes I just assume that arcane classes can “pick up the vibes” (or whatever). If I were starting a new B/X game, I would be sorely tempted to not give away which items are enchanted. It would make detect magic a more valuable spell. And it would give sages more play, as adventurers would need to get their loot examined to make sure that they were not accidentally selling some ancient artifact as a simple piece of jewelry. Even if you generate treasure by the book, I think this would result in fewer magic items in the campaign, which would make the items that were discovered that much more special. This entry was posted in Uncategorized and tagged treasure on March 10, 2012 by Necropraxis. I am definitely a fan of increasing both the rareness and specialness of magic items. Without easy identification though, magic items (especially weapons and armor) can often lead to a lot of bookkeeping for the DM. So I find that it often begs the question – if magic is easy to identify (both in terms of presence and effect) then why bother with the charade of not telling the players? Instead of having them go through the ritual of rolling a skill or casting a spell why not just say it is a sword + 1 or a potion of healing or whatever. If it is difficult, how will we track effects whatnot without giving away the ballgame? Experimentation should be more interesting than the skill roll or spell cast if we are going to bother with it. Experimentation should be more interesting than the skill roll or spell cast if we are going to bother with it. Yeah, agree. That’s why I kind of like the idea of mini histories rather than just saying something radiates magic or glows. This also gives the referee a channel to communicate information about the campaign setting that players are likely to be interested in (because they are getting loot in the process). Infodumps in disguise. It does require a bit more work though. I read somewhere that EGG just told the players in his campaign what the items were and then charged them for the service later. I am going to guess that didn’t apply to things like potions of poison or delusion, or maybe not any potions at all, but rather only to more permanent magic items. Still, it is a simple fix to the problem, and is probably why the spell Identify was invented, just to make the “magic item tax” cheaper. That seems to break cursed items though, unless he lied about them and then told PCs after they started using a magic item that it was cursed. This is more or less how I have often seen it done in practice (I can’t remember the last time I saw a cursed item in play, actually). In our latest campaign the DM was randomly rolling magic items as we went along and the party collected an inordinate amount of cursed items. My cleric has a suit of -2 platemail which he refuses to give up because it’s still a better AC than any alternative he’s come across so far. My approach is that an ornate weapon may be magical so it’s worth hanging onto. Although even if the weapon is magical, it does not display any magical properties until it has been suitably activated. A sword +1/+4 vs Reptiles would exhibit no properties until it was finally used to smite a dragon (or equivalent). During which time it would function as a +4 sword, and afterwards as a +1 sword for all other times. The reasoning is that magical items possess a finite amount of power and lay dormant when they are not used for extended periods, which for an inanimate object can span generations. Spellcasters can sense magic at level on a 2 in 6. This chance increases to 3 in 6 at level 6, 4 in 6 at level 11, and 5 in 6 at level 16 (and presumably 100% at level 21). However, sensing magic is not the same as understanding the magic. For the latter the players would either have to simply experiment or I would allow the spellcaster to use something like the magical item creation rules to tease out all the subtle powers and functions (and possibly history) of the item. I like this idea. Make it cost a turn, and it also becomes a serviceable magic trap detector (or at least a “there’s something strange going on here” detector). Presumably this would be an active, not a passive, ability (as in, the player would be required to declare use). Presumably this would be an active, not a passive, ability (as in, the player would be required to declare use). We usually employ spells to determine whether items are magical, and if it will be for weal or woe to use them! Determining their specific function depends on the particular object, but figuring out its provenance is a good start.